Illustrations by Donna Ingemanson and installation by Charlotte Nickerson. This exhibit highlights my career as an illustrator and artist in a timeline with personal selections of art and licensed products. 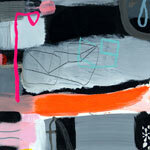 Current pieces include digital, painting, mixed media and monotype printmaking. Throughout my artistic career it has always been a journey of exploration and expansion. For years, as a student, designer, art director, illustrator and simply as an artist, my objectives always seemed like I was climbing to reach a goal, whether it was to perfect my skills, succeed at commercial assignments, run a solo business and, most importantly, enjoy the time allotted to me on this planet. My aspirations seemed to segue from one desire to the next while moving forward and still using strengths that I had learned in the past. As an artist it seems like there’s always a bit of discontent and a desire to somehow make something better. There are so many masterful artists from the past and the present that it’s easy to become discouraged. In my mind I try to see the beauty in other art pieces and use it for inspiration in my own work. Exhibiting my artwork is new for me as I have always been too busy creating art for corporate projects, editorial pieces and licensing to have time to get my work physically out into the world. This exhibit is a selection of pieces from the past 20 years that starts with the ‘Studio Wall’ which is a display of how assignments start with sketches and finished art and then translate to tangible products. Many of my newer pieces are still being licensed along with a large library of past art images. So as I continue on my artistic path of discovery and creation right now I am taking the time to pause and reflect on the steps that have brought me to this moment. Special Thanks to Karen Koskores, Charlotte Nickerson and Image Resolutions. Monotype Guild of New England exhibit at the Attleboro Arts Museum. Monotypes are one of my favorite mediums that capture spontaneity and produce results that are very difficult to control. Currently The Monotype Guild of New England is hosting its Fourth National Juried Monotype/Monoprint Exhibit at the Attleboro Arts Museum in Attleboro, MA thru May 7, 2016. The exhibit was juried by Andrew Stevens, Curator of the Collection of Prints, Drawings and Photographs at the Chazen Museum at the University of Wisconsin. Large variety of prints are included in the exhibit. With over 100 prints included in the exhibit it represents a wide range of techniques and styles by contemporary printmakers and artists throughout the United States. Sampling of prints in the exhibit. First Place Award goes to Anna Mavromatis, Houston, TX for her monotype entitled She Could Hear the Piano Playing. Several awards and merits were presented to participating printmakers. One of my favorite pieces in the exhibit is this hybrid print entitled Yotzumata by Koichi Yamamoto from Knoxville, TN. The impressive piece is a very large monotype with Intaglio Chine Colle and received the McClain’s Printmaking Award. A vast range of print sizes are included. The Monotype Guild of New England is dedicated to the art of the unique print, it is a national, nonprofit organization that fosters understanding and appreciation of monotypes and monoprints. It sponsors exhibitions, workshops, and other special programs for its members and the public. The Attleboro Arts Museum is located at 86 Park Street in Attleboro, MA. Hours are Tues – Sat, 10 a.m. – 5 p.m. Standard admission and parking are free. Donations are always appreciated. ‘Tulip 158’ solar etching plate size: 4″ x 5″ frame size: 11″ x 12″. Four of my original pieces are included in the Small Works Gallery Artists Exhibit in the Dillon Gallery at the South Shore Art Center thru Dec 20, 2015. This exhibit/sale is in conjunction with the On the Edge National juried show. Red Squirrel Blue Squirrel detail of reduction linoleum by Susan Stranc. It’s gallery season again in Eastern Massachusetts and there seems to be plenty of inspiring exhibits to visit. This past weekend the Boston Printmakers opened their 2015 North American Print at Lesley University College of Art and Design. The exhibit is filled with a vast array of contemporary prints in a wide variety of printmaking techniques such as these Bloodline 40″ x 30″ monoprints by Marina Brownlow from Santa Fe, NM that greet you at the entrance. The Biennial opening reception was last Sunday and was heartily attended by printmakers and their followers. It was a challenge to get up close and personal with the artwork with so many print enthusiasts. Drop by now through Dec 12, 2015 to have a relaxed engagement with the art. Mixed media by Lina Monclus. There were several prints that were inspirational and, as usual, had printmakers speculating as to how they were created. One of my personal favorites was this monotype, linocut, chine colle, sewing, drawing entitled Distortions by Lina Monclus from Broward County, FL which received a Materials Award sponored by Gamblin Artists Colors. Over the Charles River to South Boston is The Distillery that recently hosted an Open Studio where you can find a full creative community with a gallery of work by artists that occupy the building. Distillery sculptor and jeweler Rory Beerits. At The Distillery we were drawn to Rory Beerits who creates beautiful, organic jewelry and stylized animal sculptures made from wood and metals. Cedar Waxwings by Larry Barth. These Cedar Waxwings are unbelievably realistic but they are actually carved from wood and painted with acrylics by Larry Barth. The Museum of American Bird Art at Mass Audubon in Canton MA currently has several of Larry’s bird sculpture’s on view through January 18, 2016. Even the branches are created with metal and then painted. Whether you’re interested in contemporary or hyper-realism there’s plenty of art to see this Fall. Don’t miss the opening reception this Friday, Nov 13, 2015, from 6 to 8pm at the South Shore Art Center in Cohasset which features the National Juried On the Edge and the Gallery Artists Small Works Exhibits. See you there.